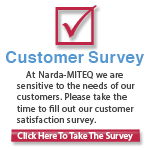 L3 Narda-MITEQ is now in position to offer select mixer models from stock for immediate delivery. The in stock selection offers a variety of models including broadband, double balanced, triple balanced, high isolation, even harmonic, and IQ versions. This selection of mixers covers a frequency range of 0.5 GHz to 40 GHz, and each model is backed by our generous warranty. Click here for a full list of our In Stock Mixers.